Miguel Lopez, M.C. 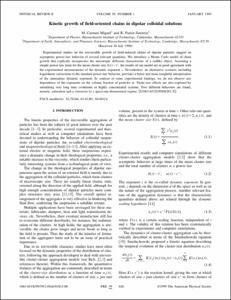 ; Pastor-Satorras, R.
Experimental studies on the irreversible growth of field-induced chains of dipolar particles suggest an asymptotic power-law behavior of several relevant quantities. We introduce a Monte Carlo model of chain growth that explicitly incorporates the anisotropic diffusion characteristic of a rodlike object. Assuming a simple power-law form for the mean cluster size S(t)~tz, the results of our model are in good agreement with the experimental measurements of the dynamic exponent z. Nevertheless, an alternative scenario, including logarithmic corrections to the standard power-law behavior, provides a better and more insightful interpretation of the anomalous dynamic exponent. In contrast to some experimental findings, we do not observe any dependence of the exponents on the volume fraction of particles f. Finite-size effects are also explored by simulating very long time evolutions or highly concentrated systems. Two different behaviors are found, namely, saturation and a crossover to a quasi-one-dimensional regime. Miguel Lopez, M.C., Pastor-Satorras, R. Kinetic growth of field-oriented chains in dipolar colloidal solutions. "Physical review E: statistical, nonlinear, and soft matter physics", Gener 1999, vol. 59, núm. 1, p. 826-834.